Exercise is Not Punishment. You Don't Have to Earn Food. Would you rather listen to this article? Use the player below or download on iTunes. 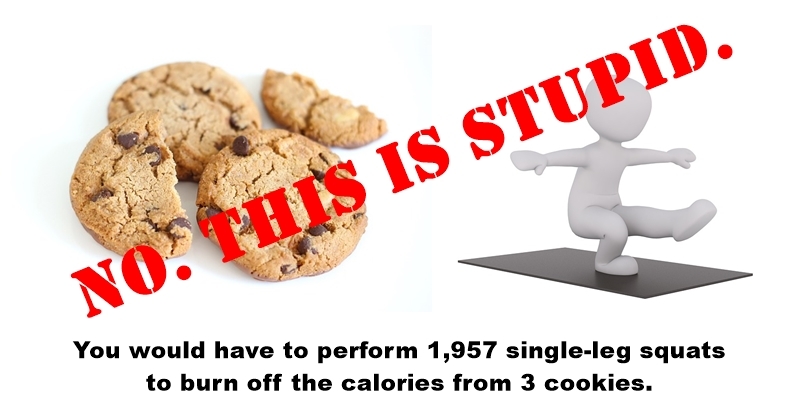 How many minutes of vigorous exercise do you think you’d have to perform to burn off the calories from three cookies? Who cares. That’s a stupid question. You’ve no doubt seen the charts and memes that litter social media around major holidays. 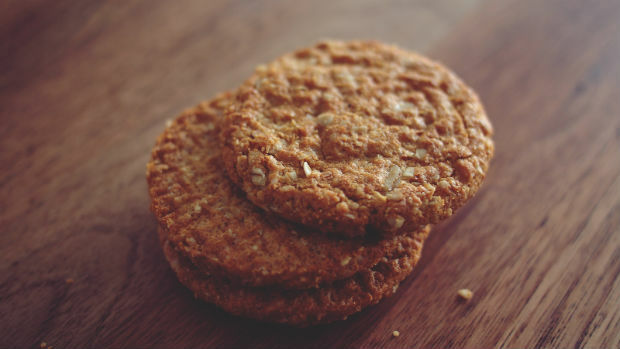 On one side is a list of popular holiday-time treats with the amount of calories beneath each one. On the other side is how much exercise — number of miles you’d have to run, burpees you’d have to perform — to burn off those calories. You ate it, now negate it! you’re told. These images exacerbate the belief that exercise is punishment for eating. You have to earn or work off your treats and meals. Years ago before a feast, like Thanksgiving, I’d do extra workouts to “earn” my upcoming meal. I’d perform a grueling strength training workout and go for an extra long walk early that morning in anticipation of the surplus of calories I’d soon consume. “I’m earning my food!” I’d exclaim as I power walked the neighborhood. During a more recent Thanksgiving feast as I stepped outside to walk my dog, I recalled those previous years when those walks were, essentially, a punishment for the food I was going to consume later in the day. I was telling myself I had to earn the right to eat the amazing food my mom was preparing. Moving your body should never be done as punishment (because you over indulged, for example) and you do not have to earn your food. Some even add “because you’re not a dog” to that statement; I disagree — I don’t make my dog earn his food either. I feed him because I love him and I’m a responsible canine-mom. Now my pre-Thanksgiving walks are not done for the sake of burning calories to earn a slice of pecan pie. Exercise is not punishment. I take those walks because I know it’s good to move my body. It allows me to clear my mind, enjoy the fresh air and sunshine, watch the turkey vultures cut through the stiff breeze searching for an afternoon snack, and laugh at my dog as he stares down neighborhood squirrels and hikes his leg on every stop sign and fire hydrant. These walks make me feel good and I enjoy them. That is why I do them. It’s not necessary to do anything out of the ordinary before special occasions or holiday feasts. As long as you’ve created an enjoyable, sustainable lifestyle, that one meal is not going to make a difference. Go about business as usual, following an eating style that works for you (such as The Diet That Has No Name) and move your body in ways you enjoy. This can be in the form of total body strength training workouts, yoga, hiking, rock climbing, spinning, or whatever you enjoy. Instead of panicking over how many calories we’ll consume on a special occasion and causing ourselves unnecessary stress we should, instead, be grateful we have an abundance of food to enjoy and people to share it with. Let’s get absorbed in the moment when everyone is around the table talking, laughing, and doing the goofy things that make our families unique (we all have them!). Stop obsessing over how many carbs you’re eating and immerse yourself in the moment. We’d be best served to not obsess over a single meal and instead focus on what we do the other 364 days of the year. It’s what we do on those days that has the greatest impact; not a single meal, no matter how large and calorie-laden it may be. A few meals aren’t worth obsessing over. It’s the actions and choices we make repeatedly over a long period of time that matter most, because they determine the ultimate outcome. Exercise is good for you, but make sure you’re doing it for the right reasons. Consider the following a litmus test of sorts to determine whether your reason for exercising is good, or needs to be altered. There are numerous additional reasons to move your body, but you get the idea. If you currently work out for the unacceptable reasons, make it a goal to choose one of the better ones listed above. Before each workout ask, Why am I doing this? Make sure it’s a good reason. Vow to no longer punish yourself with exercise. Don’t look at food as something you have to earn. Remember, it’s not about a few meals. Focus instead on what you can do well the additional 360+ days of the year because those matter most. Like what you read? Never miss a thing! Sign up below to receive the newsletter.